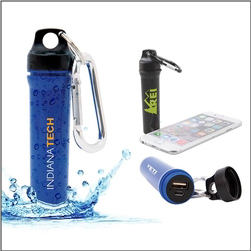 Order custom imprinted water resistant power banks that charge a cell phone, accessories, etc. These ideal power cells are water resistant with a screw on seal top, and include a convenient carabiner. 2600 mAh power. Great for working outdoors, camping, sporting events, school booster fundraising, company giveaways, tradeshow marketing, and more.